Jordan Welter of Go Green Enterprises. When Jordan Welter was pulled over by a state trooper on the Fourth of July last year, Welter immediately thought of what was in the back of his van: hundreds of pounds of weed. "Where are you headed?" the officer asks when Welter rolls down the window. Welter tells the truth: He's on his way to Pullman from Clarkston. So why, the trooper asks, is he taking the long way that avoids crossing the Idaho border? "Because the back is full of weed," Welter admits. Welter explains that he's licensed to do so. The officer just laughs, shakes his head and remarks that, back in the day, he would have gotten a promotion for catching someone with that much weed. Those days are gone. 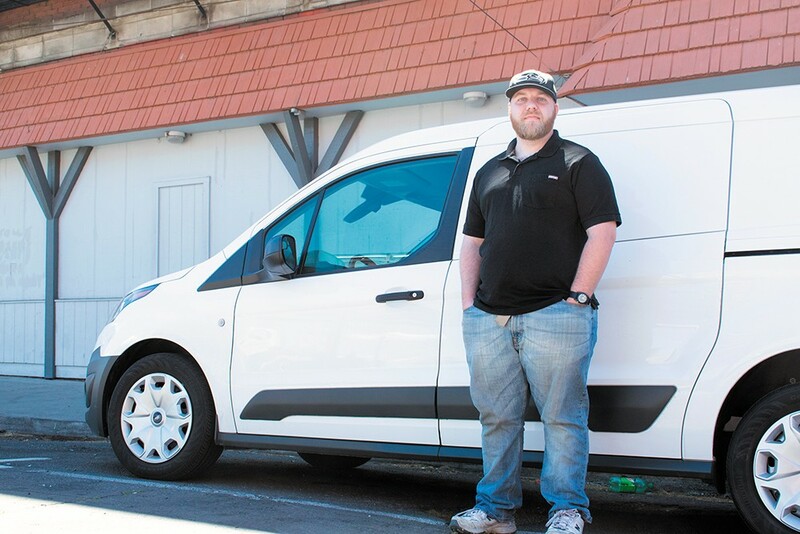 Now, Washington's legal marijuana industry has created a demand for cannabis transporters like Welter, manager of Go Green Enterprises. Go Green, based in Spokane, was the first company in Washington to get a marijuana transportation license in 2016. They move large quantities of cannabis from farms to stores or laboratories, often driving across the state. "We're drug mules," Welter says. "We take it from place to place." And with that comes awkward encounters with law enforcement and plenty of safety risks. Kevin Lynch, the owner of Go Green Enterprises, named his van "Greta." The seed money for the company came from selling a truck. He asked Welter, who was managing the tech department of an Office Depot at the time, to join him. For a while, they were the only two drivers for Go Green. Now, the company has a handful of vans driving all around the state. They haven't run into any problems with law enforcement, but Lynch says it still feels weird carrying that much weed when a cop comes around. "I will never shake that vibe," Lynch says. "I'll probably shake it when it's federally legal." Though they rarely carry this much, you can fit millions of dollars worth of cannabis product in one of Go Green's vans. But the vans themselves are pretty nondescript. That's on purpose, Welter says. Drivers can't carry guns. They protect themselves from potential robbers largely by going unnoticed. They all have a cover story — which Welter won't share — in case someone asks what's in the van. If product needs to be transferred from van to van, they try to meet in vacant lots where nobody will see them. It doesn't always work. Some people can still figure it out. Welter has never had to physically defend himself. But he's come close once or twice. In downtown Seattle, for example, a guy approached him while Welter was in a parking lot having a cigarette. He asked Welter how much weed he had in the van and whether he carried a gun. When Welter tried to get him to move along, things got heated. "He looked me dead in the eye and goes, 'Well, what would you do if I robbed you?'" Welter says. Luckily, another driver who Welter was meeting came, and the situation fizzled. The incident was just another example of how risky the job can be if something goes wrong. Still, the biggest challenges, Lynch and Welter agree, aren't necessarily the safety risks but the constant driving and paperwork. Welter drives six days a week, managing the company from the car. As much as the company focuses on transportation, Welter says, they also focus on customer service. Because even though there are some inherent dangers, the drivers are constantly meeting people — farmers, retail store employees — and trying to set themselves apart from the other weed transporters in the state. They can connect farmers looking to get rid of product with processors, for example. They're drug mules, sure, but they also act as information brokers, Welter says. The original print version of this article was headlined "Legal Mules"